What’s one thing we all really want? That’s an easy to answer question – we want to be able to do what we want, when we want. In a word, we want freedom. What’s the easiest way to make that happen? Get organized! But you knew I was going to say that, right? After all, that’s my job – I help people get organized. But more than that, I help people live better lives by adopting an organized lifestyle. My real goal is to help people be organized, not just get organized. On the face of it that may seem like a subtle difference, but the difference between be and get is quite distinct. Before you can be organized, you have to get organized. Before you get organized you have to pare away the excess. Simply put, you have simplify. Let me explain: Disorganization leads to complication. Complicated things takes more time and more effort. Simple and complicated are at opposite ends of the same spectrum. The difference between a simple life and a complicated life is often determined by the level of organization. That’s because the essence of organization is really about simplifying. Organization is about creating systems and routines that support us. We should be able to rely on our systems to make daily life easier and to reach long term goals. Routines allow us to easily move through our days without having to over process our actions. Together systems and routines simplify our lives. Guess what the end result is? More freedom! That’s right, organized living gives you freedom. Freedom to focus on the things you want to, freedom to be in the moment, and freedom to relax. So, back to the beginning – what’s step one in getting to the blissful place of freedom? The process of simplifying is actually quite simple, but if you are already living a complicated life you may feel like you are stuck in a perpetual crisis mode. Everything feels like it has a sense of urgency attached to it. When you feel like this it’s critical you take the time to assess your priorities. It may feel counter intuitive to take time away from doing to assess, but if you are going to regain control and simplify it’s exactly what’s needed. Stop everything. Literally, just stop. Feel what it’s like to just breathe and be in the moment. Now declare a hiatus on accumulation. Don’t add anything to your life that isn’t absolutely essential. Don’t buy anything that you don’t truly need. Don’t say yes to any requests unless they are mandatory. Stopping will help you gain some clarity about what’s really important. It will help you think before you act. Reflecting will allow you to identify the things that are truly important to you. Far too often we give our attention to things that don’t really matter. We usually do this by default. We may have been conditioned to always say yes. We may think we ‘should’ do something, so we just keep doing it. A ‘should’ is very different from a want or a need. Reflect on your belongings as well as your commitments. We often keep things that have very little, if any, meaning to us. We do this out of guilt. We do it because we spent good money and don’t want to admit it was a mistake. We do it because maybe it will come in handy someday. The reasons go on, but none are going to make a meaningless object meaningful. Using the insight gleaned from your reflection exercise, decide what is deserving of your attention. What do you want to focus on? What do you want to look at day in and day out? What will get your time? These will be your keepers. Now it’s time to let go of all the things that did not make the cut. There is no point in keeping anything, whether that’s a possession or a commitment, that doesn’t make you feel good. Holding onto things that don’t contribute positively to your life just creates more work. All the excess means more to clean, more to remember and more to take care of. Let go of the unneeded and unloved. 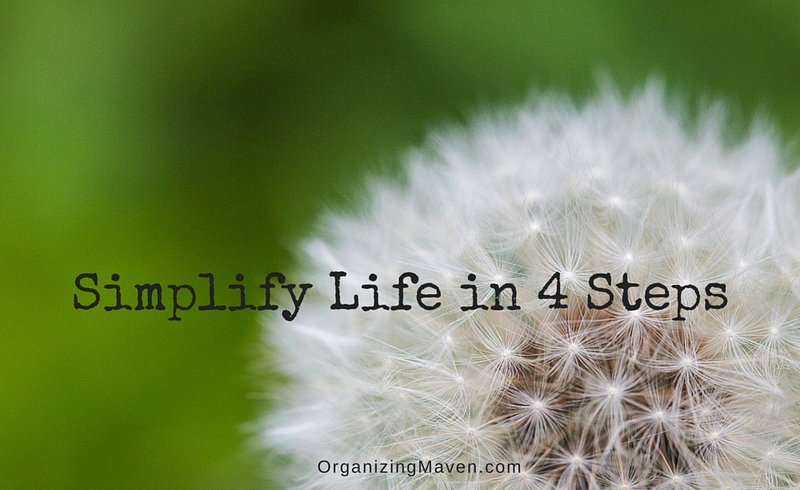 Remember, simplifying will make becoming organized so much easier. Here’s some more good news – even if you stop right here, you will immediately begin to enjoy more freedom. Want even more help simplifying your life? 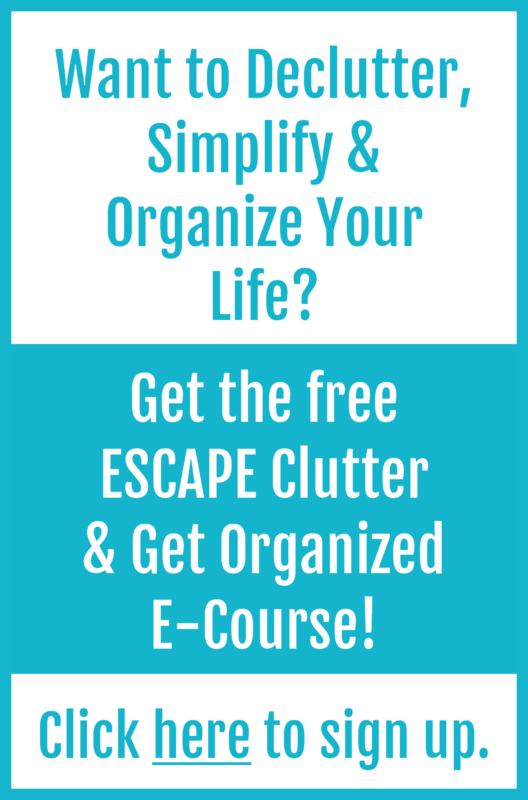 Be sure to sign up for the free e-course How To ESCAPE Clutter, Get Organized and Simplify Life. And for support and motivation, I invite you to join our private group on Facebook – it’s a place to ask questions and find accountability. Of course, you can find loads of inspiration for clutter clearing, simplifying life and organizing on The Organizing Maven’s YouTube Channel.